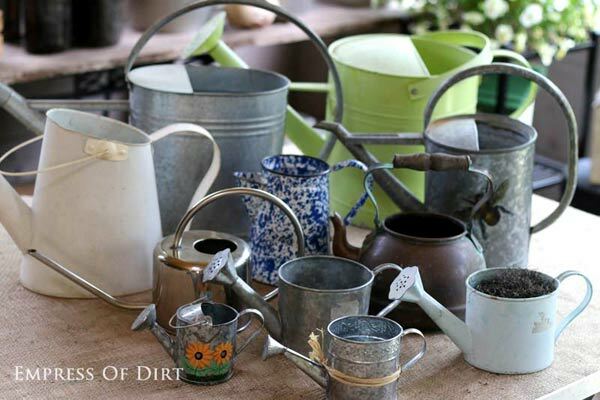 Got an old watering can? 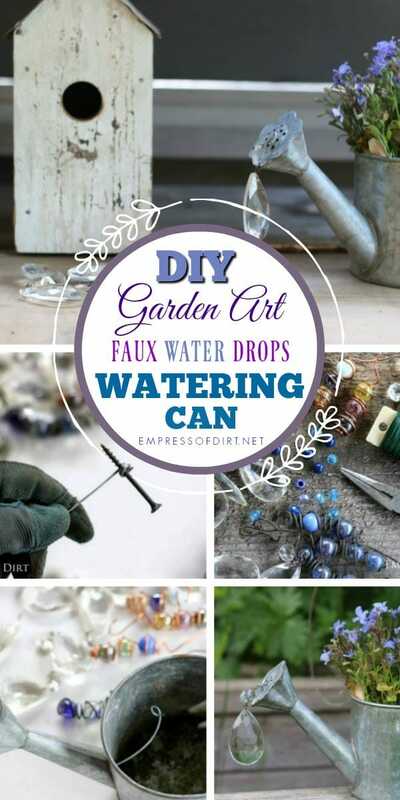 Turn it into garden art spilling faux water with wire, marbles, beads, and crystals. 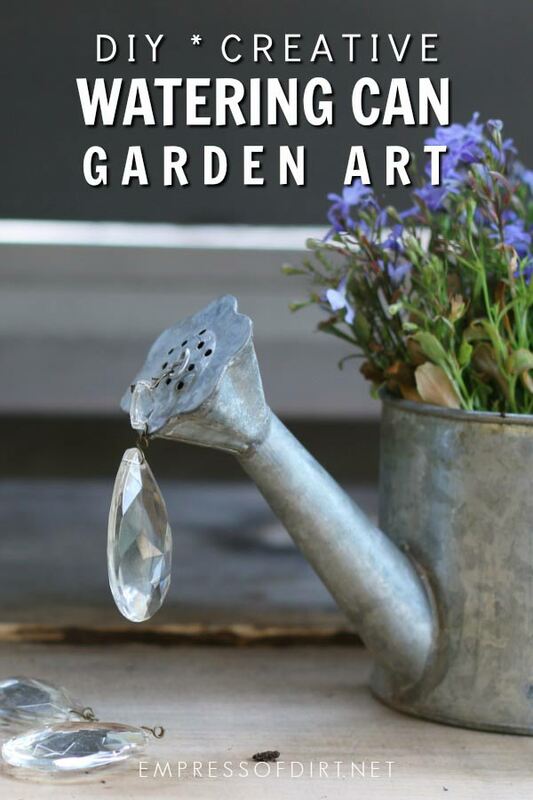 Also see the Watering Can Garden Art Idea Gallery for more ideas. If I had to pick a favorite collectible garden item, galvanized metal watering cans would top the list. If they work really well, I use them for watering the plants. But plenty of watering cans—old and new—are really poorly designed and do not balance right when pouring water. But no worries, the dysfunctional ones and the leaking oldies are perfect for garden art. 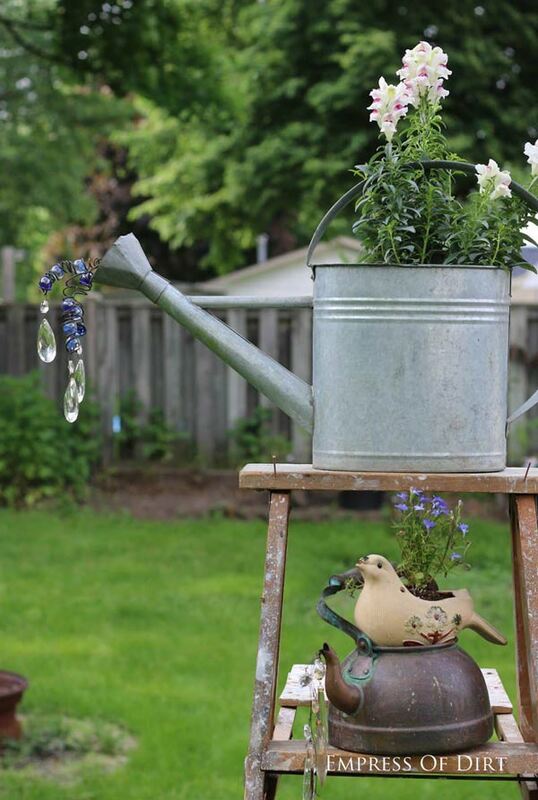 This watering can garden art project is very simple and adds a fun touch of whimsy to the garden. You’ll need just a few materials and it should only take an hour or so to complete. Wires are threaded through the spout and secured inside the watering can. Crystals, beads, and marbles are attached to the wires to look like water spilling out. That’s it! 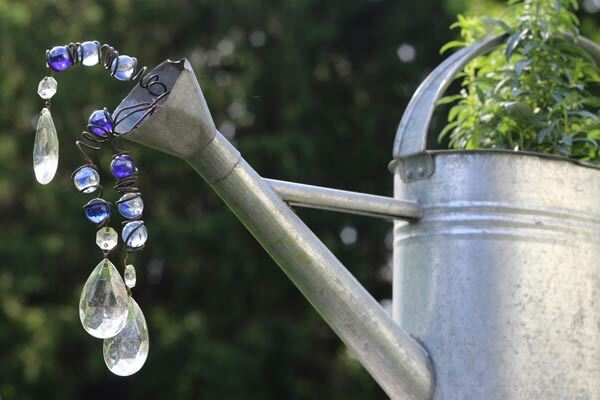 When using a watering can for garden art, it doesn’t matter if there are holes in the bottom. In fact, this is good for drainage if it will also be used as a planter. Make sure the watering can spout is designed in a way that you can easily thread wires through it. Some have openings too tiny for this. 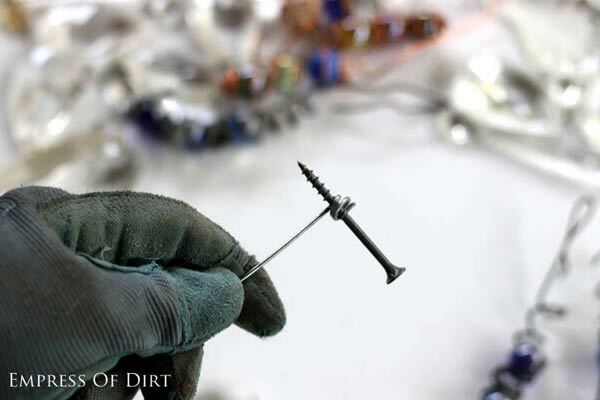 Select your wire gauge based on how firm you want the wire to be. The smaller the gauge number, the thicker the wire. I use 16-gauge wire for most garden art projects. You can see 16-gauge wire here on Amazon.com. I get these at thrift shops and yard sales. Look for unwanted old lamps that are ugly but have crystals on them! You might find them for a nice low price. 1. 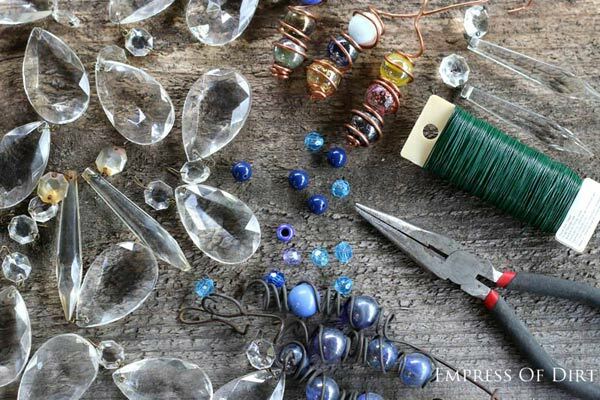 Cut wires for hanging crystals. 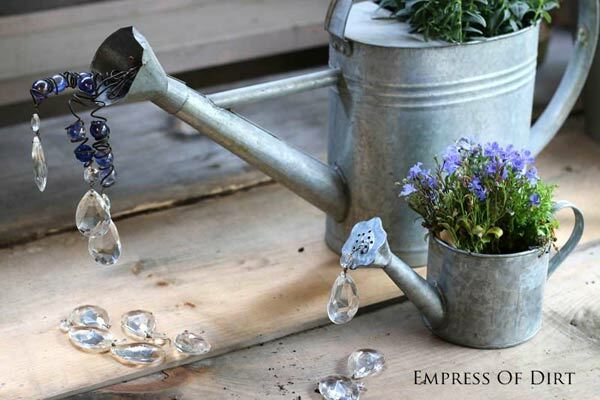 Allow enough length to secure wire inside watering can and to hang crystals at various lengths from spout. 2. Thread wires through spout and secure inside watering can. The wires will stay firmly in place inside the watering can if you wrap the ends around a screw or nail that is longer (wider) than the opening. 3. 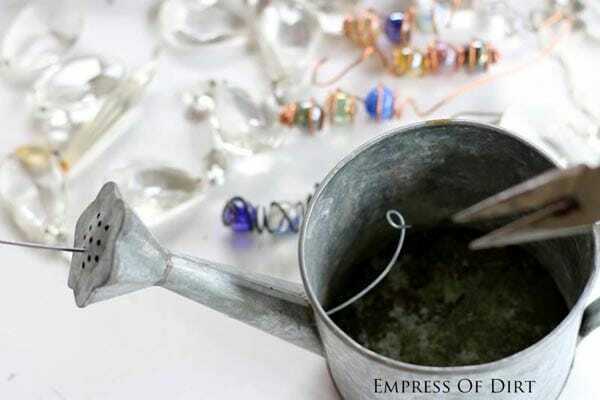 Attach crystals and beads to spout wires. Make one big crystal water drop or use a bunch of different sizes and lengths to get a dripping effect. (Optional) Wrap copper wire around marbles, leaving enough length at one end to secure to spout wires. I like to display my garden art collections on old wooden ladders. I love the contrast of the rustic ladder with the elegance of the crystals. 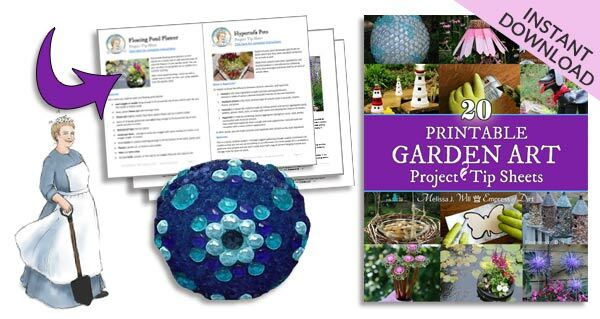 There are more ideas here in the Watering Can Garden Art Idea Gallery. 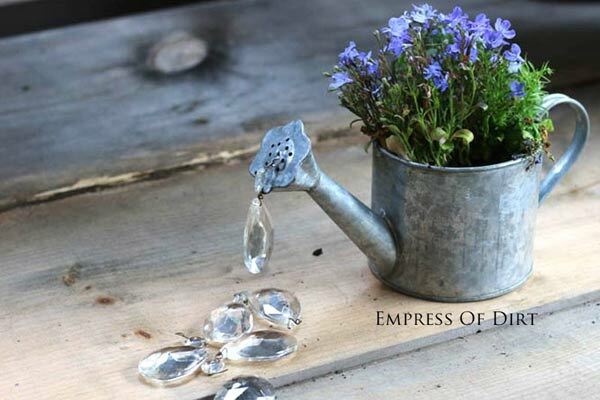 Create a watering can water feature with small pond pump. Stack large watering cans one on top of the other, forming tipsy pot planters. 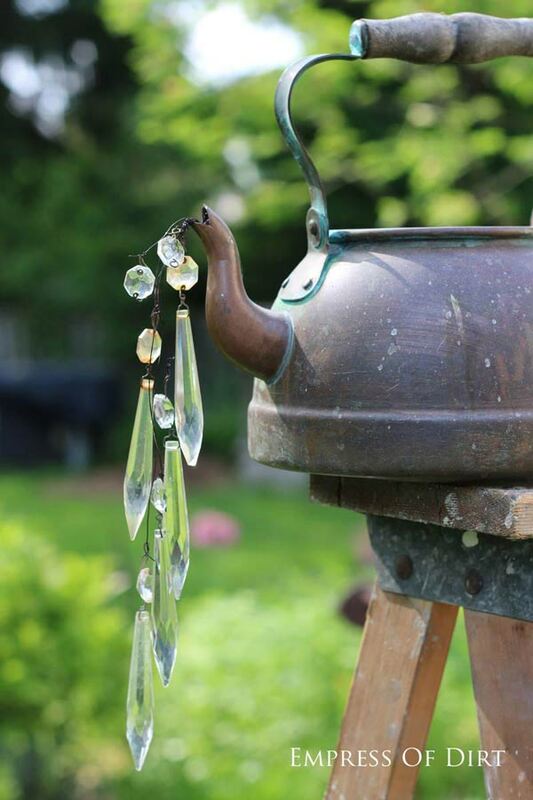 Hang watering cans with crystals (like I’ve shown you here) over bird baths or planters. Use watering cans as garden planters by adding a few drainage holes in the bottom. Insert a flower pot for easy planting. Hang watering cans on a fence or shed wall in order by size or grouped by colors. You really can’t have too many. Old kettles and water pitchers work great too! Love the beads. My go to when I have friends over is: I place large chunks of ice in the watering can and hang it over a bird bath. As the ice melts it drips into the birdbath. I’m going to add your bead idea this year. Thanks for the tip.